In the 1950’s Alan Davie was recognised internationally as a new radical force in modern painting and was hailed by art critic Alan Bowness as, alongside Francis Bacon, one of the most influential artist of his time. He was an artist who created his own unique style, thoroughly spontaneous, and on drawing from a number of different interests, including his own experiences of primitive art, Abstract Expressionism, Surrealism and Zen Buddhism. However, despite his diverse influences, a Davie painting could never be mistaken for anyone else’s work. Alan Davie first trained as a painter at Edinburgh College of Art where he also took up jazz music, and earned money as a musician, poet and jeweller. After his marriage in 1947 to fellow art student Janet Gaul, he travelled widely in Europe and for the first time was exposed to Italian masterpieces such as Cimabue and Giotto in Florence, before meeting Peggy Guggenheim in Venice who introduced him to Pollock’s early work. Her recognition and later patronage of his work propelled him onto the international arena. When Davie returned to England he was taken on by the London gallery Gimpel Fils, where he had his first solo exhibition and from then on had the support of both the gallery and the Gimpel family. Initially however, it was in America where he experienced the greatest success; at his first New York exhibition, every painting sold mostly to major institutions and in 1956, when he first visited New York, the city’s major artists of the day turned out to meet him, including Pollock and Rothko. In 1957 he showed work at the Museum of Modern Art in Paris and at the Guggenheim in New York. In 1958 he was part of the Critic’s Choice Exhibition selected by David Sylvester and in the same year he represented Britain at the Venice Biennale. 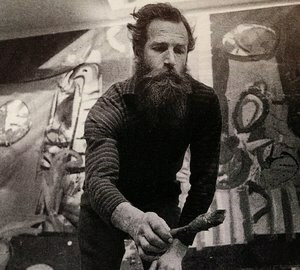 Alan Davie’s work has been widely exhibited and is included in numerous international public and private collections, including the Tate Britain, the Arts Council of Great Britain, the Victoria & Albert Museum, the Foundation Maeght and the Museum of Modern Art, New York. His exuberant and expressive paintings posses a unique force that can be associated with the New York School and also the St Ives School, yet he also stood alone from these groups. He borrowed freely from all cultures and it is the combination of these experiences, together with his freedom of expression that gives Davie his unique style.